I've been working out a lot lately and needed a good tank for when I'm at Orange Therapy. I used some Nike wicking waffle knit and an athletic knit I picked up in Las Vegas. 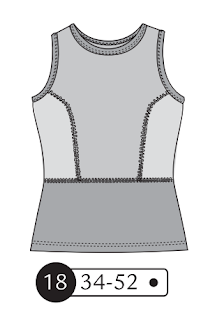 I chose to use this newest Ottobre for the athletic tank. I'm really happy with the fit. This is my normal size 34. The only thing I will change next time is to lower the neckline by an inch or so. I wore it today to Orange Theory so the spots on the front are sweat. Just keepin' it real for you guys . . . I really like the princess seams on this top. I did do my normal 1" addition for the torso. You could also add a circle skirt instead of the bottom panel and have a cute summer dress. See how high the neckline is? I used my coverstitch attachment on my Janome with the Nike fabric and it worked really well. And I think I've successfully tackled tacking on my new machine! I have more things to show you but I just need time to photograph them! And I'm working on a leather purse. More on that later!